We've been at the dock in Opua for THREE SOLID WEEKS, working on the boat. It seemed kind of chilly at first, but we've stopped wearing fleece and polypro, and moved on wearing jeans. We have to keep covered up here because of the midges (itchy biting insects) Many of our friends are here. The Opua Cruising Club and the ICA All Points Rally provide nightly food and drink and interesting speakers. Lots of cruisers are buying cars. We've contented ourselves with renting occasionally. 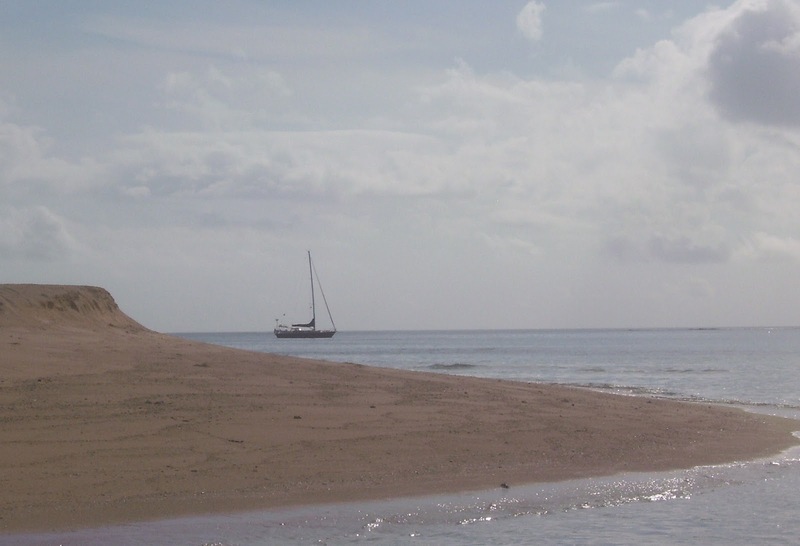 Apart from that, it's not all bad: we have beautiful and pleasant surroundings, and Bill can roll out of bed in the morning, drink his latte, then stagger over to the marine store, empty all the money out of his pockets and load up on stuff. Uh Oh...they let him open an account. There'll be no stopping him now. Fortunately, he found some miracle potion that cleaned the rust off the deck. We have to open a local bank account in order to shovel out the money fast enough. Ugly rusty anchor chain stained the deck. Tonga was beautiful, and each island group had unique geography. Vava'u had verdant steep sided islands, Ha'apai had more low lying islands with extensive reefs. Tongatapu to the south, had large and small islands and an actual "city" or big town. Overall Tonga felt cool and breezy, and the water seemed cooler. Much of the time, we had blustery weather, so we didn't really get to enjoy snorkeling much at all. We had hoped to make up for having cut short our stay in the Tuamotus. But that didn't happen, which was disappointing. The capital of Nuku'alofa had some unexpected treats: fantastic donuts and good Chinese food. Also, there was a wide variety of fruit for sale and INTERNET CAFES! Tom arrived November 21st and a good weather window was building for the passage to New Zealand. So we stepped up the pace of preparations to leave: provisiong, fueling up, taking on water, and performing the rituals and incantations required to check out of the country. We had planned to leave October 28th, but we managed to leave the anchorage for another island farther out on October 26th. That evening, another boat hailed us as they passed by on their way out. Their trip was more difficult than ours: they broke 2 shrouds. Tonga is divided into three island groups: from north to south: Vava'u, Ha'apai and Tongatapu. Bill hard at work, using the mostsophisticated navigational tools available. After a pleasant month in the Vava'u group, we've moved on to the Ha'apai Group. 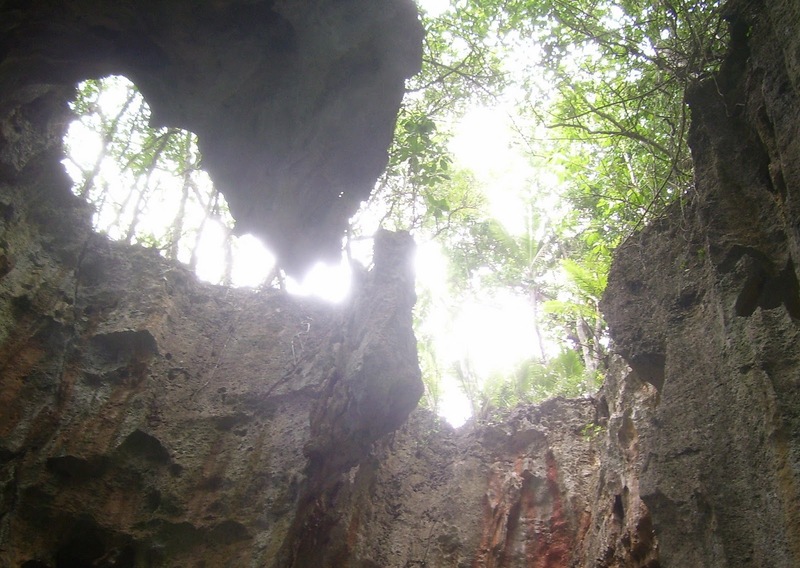 It's an area of small, low lying islands, with many coral reefs that require careful navigation. Bill has always done a good job at it. There are two islands connected by a causeway are about 5 miles long. There must be about 12 churches, big and small along the way. And services take place several times on Sunday. At 5 in the afternoon, we stopped to listen to the wonderful singing at several of them. Between rainstorms, we managed a bike ride on a quiet Sunday afternoon. After waiting out some stormy weather, we moved down to another island, where we were invited to lunch by a local family, along with other cruisers from Seattle, England and Austria. The family consisted of three brothers, their wives, children and their own parents. They treated us to a wonderful lunch of seafood (lobsters ) caught the night before. In exchange, we all brought various gifts of things we thought they could use. A couple days later, we moved down to the Nomuka Group, a couple of largish islands with a fairly sheltered bay between them. Some friends from the Northwest were there as well. It was calm weather when we went to bed, but the wind switched to the south and kicked up during the night. At 5am, someone knocked on our boat and called Bill out. Another boat had blown onto the reef next to shore when the wind changed. So Bill and the other guys went over in their dinghys, and over several hours managed to kedge the boat enough so it could power itself free. This was amazing because the tide was going down all the while. Also amazing the boat was undamaged. It has a fat winged keel and it was just sitting on flat shelf. All's well that ends well. When we left a few days later, a humpback whale mother and calf were loitering outside the pass. We stopped as they slowly circled us a couple times before we both moved on our ways. Some of the outstanding features of Vava'u are the sea caves. 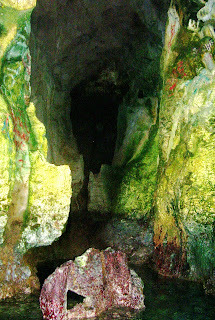 Some are accessible at the surface, such as Swallows Cave. Here's some photos. We ended up waiting out a rainstorm while floating in our dinghy in the cave. 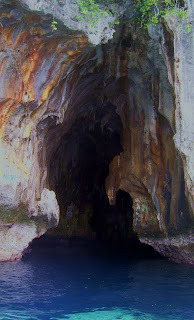 It should be called Bats Cave, because it's full of big brown bats, not cute little swallows. It's open to the sky on top. We have safely arrived in Opua. It was a remarkably fast passage. Best memory: sailing into the Bay of Isles, hand steering in 25 knots of breeze, watching the sun rise behind us, lighting Cape Brett up in a warm red glow. We had our share of equipment breakage. Probably the most serious was with the running rigging. A car on the mainsail track failed, creating a flutter in the luff that threated to damage the adjacent cars, but fortunately never did. More serious was the chafing problem on the top spreader that eventually forced us to sail with two reefs in the main the last 2 days. 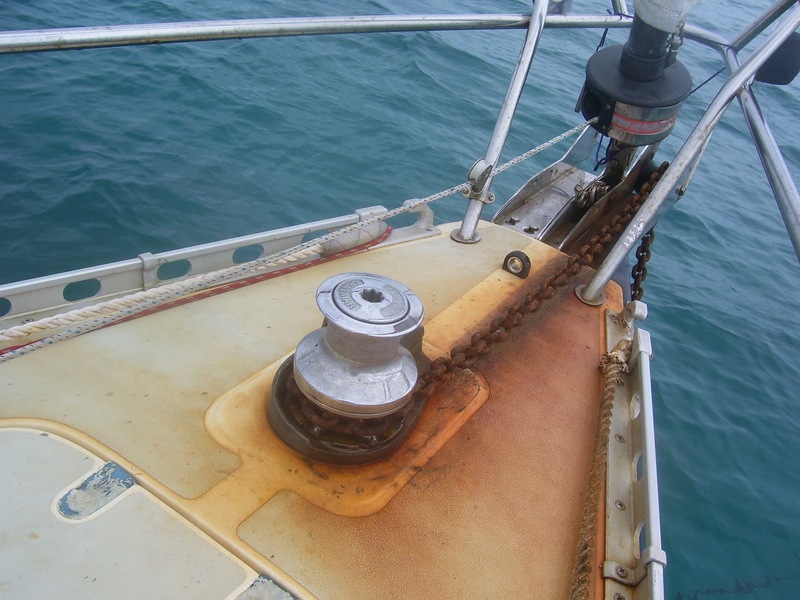 We also had a near disaster with the roller furler. Late on Saturday, Bill noticed a frayed spot on the furling line, up near the bow. When we investigated, there were only a few strands of the line left. If it had parted, the whole sail would have unfurled --- in 25 knots of wind. Not good. We tried fixing it, but the sun was going down and it was very difficult working at the bow. Bill was up at the pointy end (I was cowering at the shrouds 10 feet behind shouting encouraging, but no doubt annoying, words) alternately getting lifted eight feet above the water, then plunged down into the waves, trying to tie a new line on. We finally gave up and decided to sail the rest of the way under just our double reefed main. Despite having so little sail up, we still made good progress, maybe 5.5 knots (instead of the 7.5 or so if the jib was working). The first order of business was to get some New Zealand money. 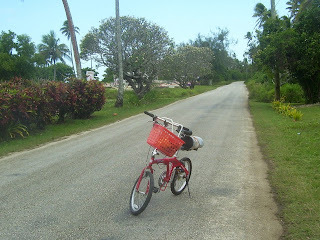 There is no ATM in Opua, so I decided to ride Bill's bicycle into the nearby town of Paihai, about 8 km away. Bill's bike is one of those fold-up jobs with tiny 12" wheels. The roads are narrow and windy, so I decided to wear the climbing helmet we have on board. I probably cut quite the amusing figure: tall lanky guy on a clown's bike, legs akimbo, peddling like mad and weaving uncertainly with my bright orange helmet. As I peddled along, I wondered what would happen if I had an accident and the police investigated. They'd find this unshaven guy in filthy clothes who hadn't taken a shower in over a week on this ridiculous bicycle. Total bag guy. Another night in the washing machine, non-delicate cycle. Last night, about 10pm on Bill's watch our first squall came through. From a pleasant 15-20 knots, the wind came up to the low 30s in seconds while Bill madly scrambled to roll in the jib. It only lasted a half hour or so, but like all squalls, it was impressive. The rest of the night was uneventful, although the winds were in the 25-30 range most of the time. Right now, we're seeing mid 20s. The wind has veered to the southeast, so all that wind is mighty cold. Last night was spent in sleeping bags for the first time. A night watch involves suiting up for a space mission. With the wind on the beam, the ride has been rough, but even with our more-or-less permanent configuration of two reefs in the main, it's been a fast one. We're continuing to average 150+ mile days. As always, it could be worse. 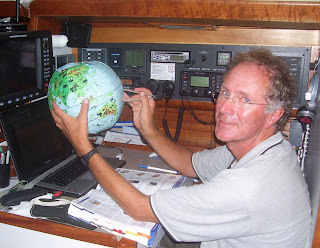 We chatted with nearby boat PROXIMITY out of Fiji, bound for Whangarei, who has spent the last seven days close hauled! The boat continues to hold up well. No problems except for the chafe on the main. Despite the commotion, Kathy continues to churn out great meals. For yesterday's lunch we had rice with eggplant, ginger, and bok choi, then mushroom gnocci with green salad for dinner. We're on a mission to consume every bit of food that could be quarantined by the Kiwis. We're not going to come close, but it has been a heck of a lot of fun trying.